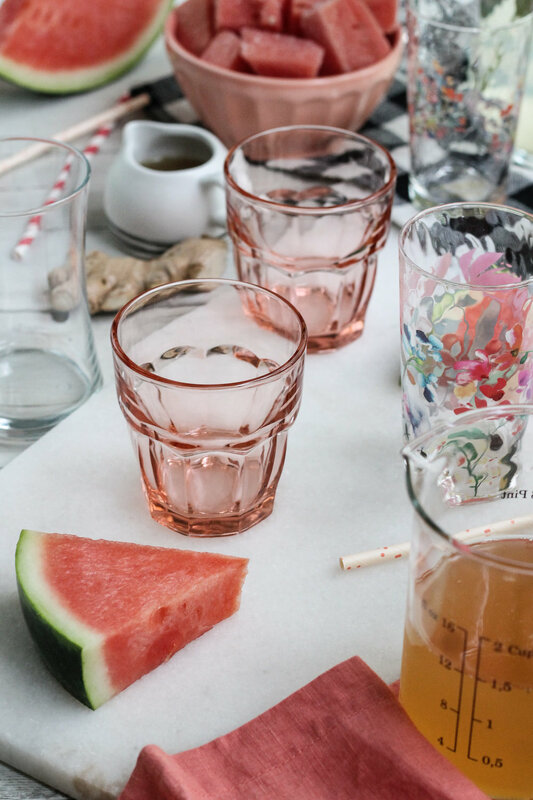 Let's whip up something pink, refreshing, and healthful for these hard-working bodies of ours. If 7/11 and a hippie had a baby, it would be this slushie. (And that is a really good thing, in case you weren't sure. It is beyond hot here in the trenches of historic Virginia. Days like this remind me why I vow to move to Vermont every. single. summer.. I am pretty sure I heard a sun-bathing lizard crying for mercy the other day. When it comes to surviving summers in the south, we natives have a few tools in our metaphorical backpacks. 1. Wear as little clothing as you possibly can. It's a fine line between perishing into a puddle of perspirant and being mistaken for what my mother would call, "a lady of questionable morals." Find the line and ride it all the way. 2. Fall in love with messy buns because the humidity just will not have it any other way. 3. Drink fluids. Lots of them. Preferably fluids of the pink and frozen variety. The first step to this super simple concoction of ours involves breaking down a watermelon into roughly 1x1-inch pieces. We are essentially making watermelon ice cubes. Next, a simple syrup spiked with spicy ginger. If you are like me, these 9,032 degree days really mess up my stomach and I often return from a short walk with Sabine feeling like I am in the beginning stages of the stomach flu. A hefty dose of freshly grated ginger will calm your stomach and add another layer of flavor and surprise to our slushies. When the watermelon has frozen and the syrup has cooled, it is time to break out the blender. Once the slushie is super smooth, divide it amongst your prettiest glasses and get ready to sip on something extra special. Surviving summer can be a challenge, but there was never a more delightful tonic. Now all we need is a couple of waving palm leaves and a whole lot of sunscreen. Line a large baking sheet with wax paper and spread the cubed watermelon evenly over the pan. Freeze for 4-6 hours; until frozen solid. 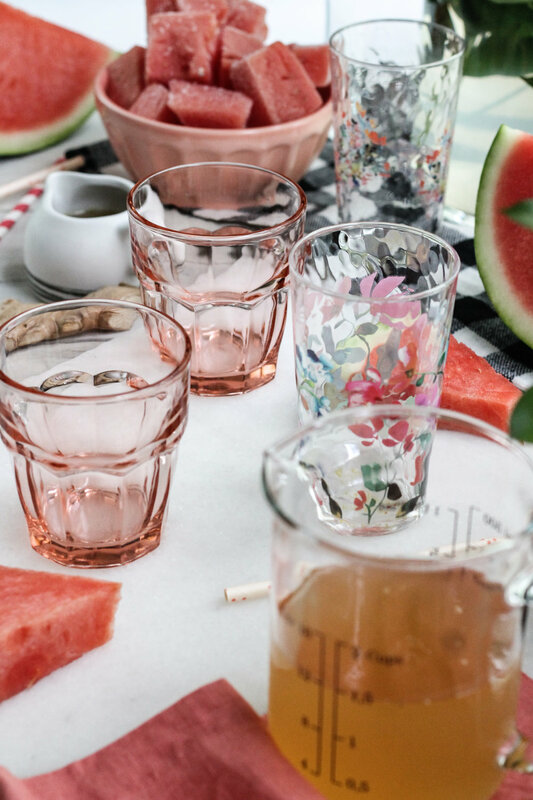 While the watermelon is freezing, prepare the ginger syrup. Combine sugar, ginger, and water in a small saucepan and set over medium heat. Cook, stirring often until the sugar has dissolved and the mixture reaches a simmer. Simmer for one minute, then remove from heat and allow to cool completely. Combine frozen watermelon, prepared ginger syrup, and kombucha in your blender and blend until very smooth. Pour into glasses and serve immediately! Your iced coffee has some serious competition coming its way. Ready to knock out those winter colds? Me too. I am coming at you with a nameless hot beverage, but what it lacks in title, it makes up for in flavor, comfort, and restorative powers. Friends, I’d like you to meet my steaming cup of toasty, spicy, pecan milk.